Adding 18S to your monitoring set up will open up a new world of performance that lets you mix and master with painstaking accuracy, helping to deliver tracks that translate beautifully to any playback system. Dynaudio have applied their advanced DSP modelling technology that acoustically matches 18S to any Dynaudio Pro Studio Monitor from BM, LYD and upwards, turning two-way systems into three-way set-ups. Its punch is delivered by two brand-new custom MSP+ Hybrid Drive units and a 500W amp for absolute control and power. While it can of course be successfully used with any other brand of speakers, getting 18S to match seamlessly with Dynaudio PRO’s range of professional monitors is key for absolute accuracy when mixing and mastering. That has meant assessing the acoustic characteristics of each of thier popular high-end studio speakers and creating custom performance maps for each one. Plus, it’s future-proof: when new studio speakers are added to the line-up, Dynaudio will release a firmware update for the 18S to add their performance maps – so it can grow along with your needs and equipment. With this information at its disposal, the 18S’s display and menu system lets you select the specific Dynaudio speakers you’re using in your monitoring setup. This means the roll-off can be tailored perfectly to suit and if you combine a LYD-48 stereo or surround setup, you’ll essentially have a stunning and full-blown four-way monitoring system at your disposal. For other models, including non-Dynaudio speakers, crossover frequency, gain and phase can be set manually in the setup menu. The 18S has a selection of RCA or XLR connections for flexibility with your rig and comes with a number of handy features to help with more advanced stereo and surround monitoring systems too. This includes the ability to set a time delay to ensure the sub and speakers are working perfectly in sync: all you need to do is enter the distance from the sub to the speakers and the sub adjusts itself automatically using both time and phase delays. There’s also a full three-filter parametric EQ to help easily defeat room modes that could affect the accuracy of your final recording. Dynaudio designed a brand-new driver for the 18S. This is made from aluminium rather than their standard Magnesium Silicate Polymer material. It has paper backing and an MSP dust-cap on the front. Why the sandwich? 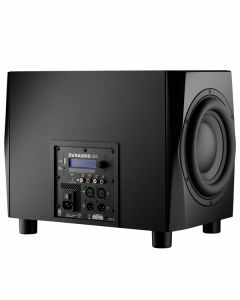 Because a subwoofer that needs to goes this low requires a different balance between stiffness, lightness and damping than standard speaker drivers. The new MSP+ Hybrid Drive units have been designed specifically with subwoofers in mind for the best performance possible. Using two of these very powerful 24 cm long-throw drivers on each side of the cabinet, in a push-push opposing woofer design, eliminates cabinet resonance and allows 18S provides extremely low distortion levels right down to an earth shattering 16Hz! 18S features a highly rigid cabinet, with the two drivers mounted in a dual-opposing configuration, which eliminates vibrations of the cabinet, and reduces colorations and distortion. The shape of the cabinet allows the S18 to be placed unobtrusively against the wall, taking up very little space in the studio.